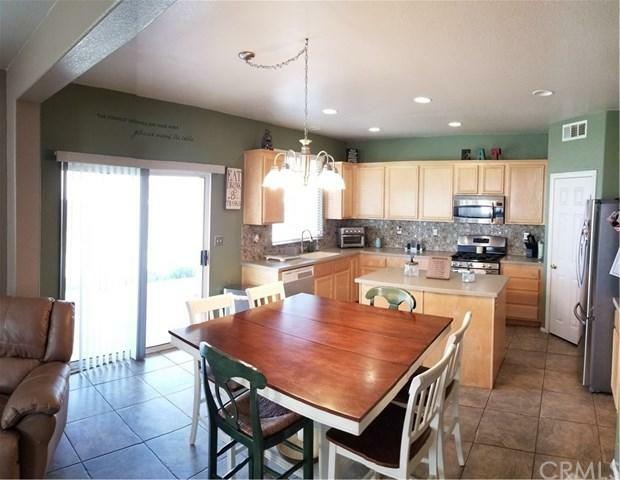 Beautiful two story home in a great community of Hesperia. Close to schools, shopping, dining, entertainment, and easy freeway access. Low maintanence front yard rock-scape and RV parking. One bedroom and bathroom downstairs, 3 bedrooms, 2 bathrooms upstairs. Large master bedroom with ensuite bathroom, soaking tub, seperate walk in shower, large walk in closet and two dual sink vanity with center seat. Upstairs also includes a large loft. Kitchen offers stainless steel appliances, lots of cabinet space, walk in pantry, and plenty of counter space with additional island. Permitted back patio and lots of room for a pool. Property also includes a 10'x20' storage shed in the back yard. This is a great opportunity to buy in the growing city of Hesperia!